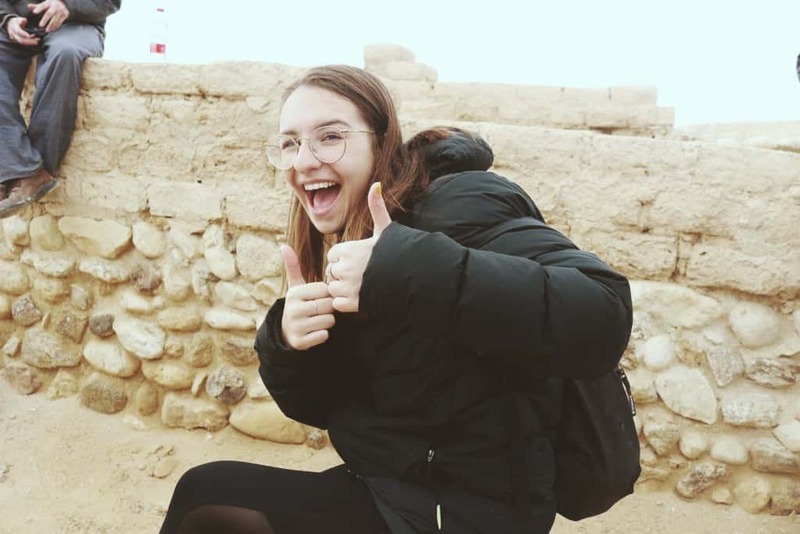 Hi, my name is Jaimi Knep from Sydney, Australia and I am currently living it up in the most hipster neighbourhood of Florentin, Tel Aviv, whilst on the Spring Semester of Aardvark Israel. I graduated from Moriah College in 2018, a modern orthodox Jewish day school. I grew up surrounded by a loving Jewish community, which shaped me into the person I am today. Through my family’s involvement in our Jewish community, I have been able to devote my time volunteering with children who have special needs and disabilities through the Friendship Circle movement and will be studying occupational therapy in 2020. This semester I have been volunteering in an ambulance with Magen David Adom (MDA). MDA is Israel’s national emergency, disaster, medical, ambulance, and blood bank service. Prior to starting my internship, I completed training in order to receive my first responder’s qualification to be able to work five, 8-hour shifts a week, for at least five weeks. Throughout my time in MDA, I have been able to experience a vast array of Israeli characters from the elderly, pregnant, teens and even deliver new-born babies! Through my service here, I have gained an immense range of medical skills as well as improved my Hebrew. I am so grateful to have had this opportunity to immerse myself into Israeli life in such a unique way by giving back, a value which has been instilled in me from my loving family. There are six students who are currently participating in MDA from Aardvark, and we have all had the most incredible time, filled with laughter, language barriers, Israeli music and some mad stories, and I will treasure these memories forever and am so privileged to have participated in MDA alongside the best people on the planet. Those being Gina, Tamar, Hannah, Micah and Liad. Through Aardvark, I was able to take part in the Ethiopia trip, which has been a highlight of my Aardvark experience. Whilst exploring the natural landscape of Ethiopia we were given the chance to understand the hardships faced by the Jewish Ethiopians and their community as they fight to preserve their faith in a background of hate. We were given the privilege to pray Shacharit and Mincha with the community, comprised of babies, teenage boys who ran the services, old women and men who held their grandchildren and even great grandchildren. Over the last semester I have met some of the most incredible people. From the hilarious madrichim who make classes, meetings and shabbatons so meaningful and enjoyable, to our Ulpan teacher Ella who makes the tedious learning worthwhile. The friendships I have created with the current students, I know are able to surpass the time difference and flight times in the future. I feel so grateful to have gotten to know the crazy Americans (Saban – my cheese eating surrender monkey and Yoni) the loud South Africans (Benji and Hannah) and the best of the British (Solly and Gina and my long-lost cousin Jessie) as well as getting closer with all of the Aussies who are also on the program this semester. I am so appreciative to my family for allowing me to spend this semester in Israel, as well as preparing me for life as an ‘adult’ as I start my journey into independence and life beyond home. I am thankful to be surrounded by people who began as strangers and who have transformed into lifelong friends as well as an international family. Love you all and can’t wait to see what happens next.